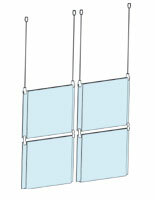 What is the purpose of 8.5 x 11 hanging hardware in your business? 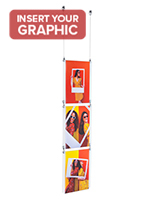 These 8.5 x 11 poster frame systems with acrylic sign holders are suspended from ceilings to create a collage of pictures, art or documents anywhere in your building. 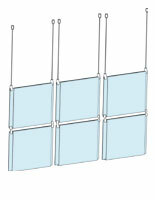 The suspended frame mounts for prints allow owners to take advantage of the underutilized space that is above the sales floor. 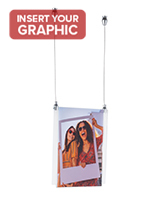 The 8.5 x 11 hanging hardware, called a poster frame system, is often used by itself to create a matrix of art or pictures that gets noticed. 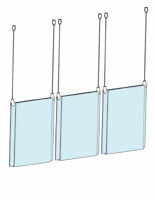 The acrylic sign holders are often placed as window displays to draw in customers. 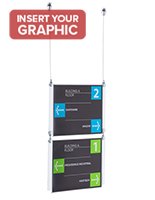 The affordable poster frame systems include everything that you need to create an eye-catching exhibit. 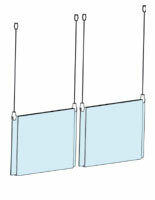 The 8.5 x 11 hanging hardware for placement against walls can be used much like a typical document enclosure. 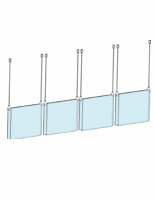 The LED illuminated sign panels are great for companies that want to get their matrices noticed at night. 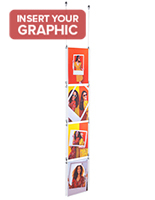 What is included in the 8.5 poster frame system? 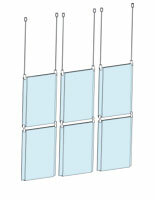 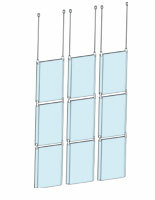 This 8.5 x 11 hanging hardware includes sign frames in portrait or landscape orientation that may be one panel or a matrix up to 16. 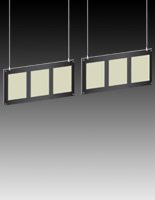 These systems are actually double-sided displays and some of them are illuminated with LEDs. 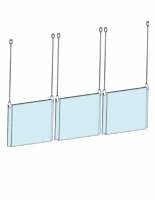 The 8.5 x 11 hanging equipment includes ceiling mounts, connectors, & sign grippers. 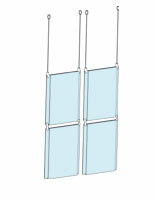 The correct hardware needed to create your matrix is supplied with an Allen wrenches included to fasten the sign grippers to the frames. 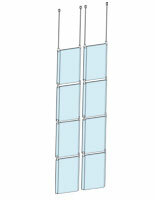 All metal parts have a brushed silver finish. 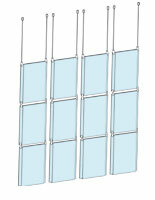 Nylon-coated stainless steel wire in 16' lengths, enough most displays, is included with the hardware. 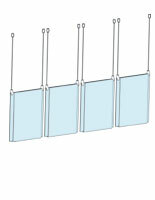 The number of bundles shipped with each order depends on the size of the matrix purchased, i.e. 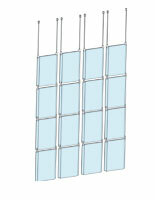 a single columnar sign includes two coils & eight bundles come with a four column order. 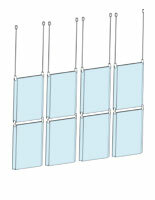 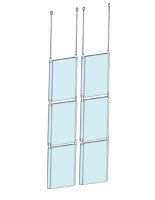 Several kinds of businesses benefit from this 8.5 x 11 hanging equipment. 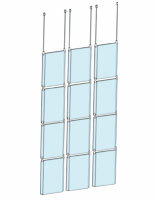 The benefits to a retail business by using this hardware are fairly obvious. 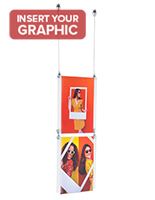 These picture displays create a wall of advertising that can highlight new arrivals, mix and match collections, and sales events. 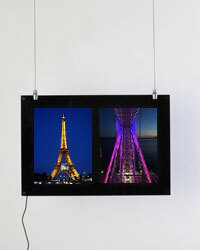 These mounts also help the service industry, like salons, to present photos of their work, signature cuts and styles. 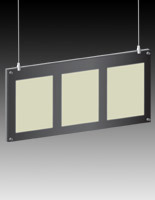 Real estate offices are able to advertise homes for sale even when their offices are closed with a well-placed, LED illuminated window sign. 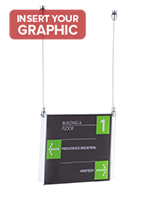 Businesses may additionally use a well-placed matrix of signs for their large atrium area or foyer. 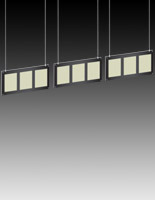 The signs can be artistic or informational by creating a focal point in a design scheme or pointing people in the right direction. 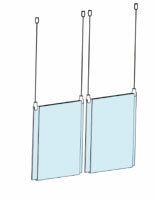 There is no end to the benefits of these acrylic sign holder suspension displays!